Please note that these earplugs are covered in a protective layer of cotton wool that must be removed before use. Wax is nature's very own earplug, it does sound a bit strange but it is absolutely true, it has been one of the original materials used to make ear plugs for decades and of course still is. All totally natural and enviromentally friendly Quies wax earplugs are ideal for blocking noises especially during sleep. These exceptional earplugs have the ability to block 27 dB of irritating noise (based on internal testing by the manufacturer). The wax used in the earplugs is very soft and hypo- allergenic, once pushed into your ears the wax will gently soften further due to the natural heat from the body and mould closely to your ear. Helping to give a stress free and comfortable sleeping experience. Effective noise protection: Quies natural wax earplugs keep your hearing safe, with a noise reduction rating of 27dB. Because they are made from natural wax, Quies wax earplugs warm to your body’s temperature and lightly condition the lining of your ear canal. In fact, they are so comfortable that you may even forget you are wearing them! They are also highly malleable, conforming to the unique shape of your ear. 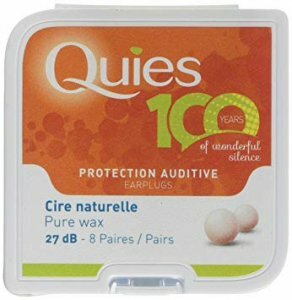 Quies natural wax earplugs are perfect for prolonged wear, and should be discarded after each use. While sleeping: use at home and on the go. At work or while studying: improve concentration in noisy environments. For music or loud noise: enjoy concerts safely and protect your ears when using heavy machinery. In the cold: protect your ears from low temperatures. Wash your hands. 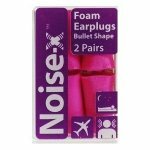 Remove the cotton packing and roll the earplugs between your hands to soften them. Mould the earplugs to fit the shape of your ear canal. Gently press the entire earplug into your ear. Pull your earlobe back with the opposite hand to open the ear canal; this will allow any air to escape and prevent any buzzing or ringing in the ear during use. Use only if your ears are clean and healthy. Keep your earplugs in their case and store in a cool, dry place.